Knowles James "The Legends of King Arthur"
Chretien De Troyes Four Arthurian Romances: "Erec et Enide", "Cliges", "Yvain", "Lancelot"
Gertrude Hall Brownell "The Wagnerian Romances"
Geoffrey Chaucer "The Canterbury Tales"
As the Roman Empire declined and 'civilised' Greco-Roman culture was overcome by a diversity of 'barbarian' counter culture, so literature was lost to what has become known as the 'Dark Ages'. With the end of classical culture European thought had lost its central focus of Rome and scholarship was left to the many emerging monasteries. The Dark Ages is seen as a cultural step backwards, however this was a time of gradual fusion between the largely Christian Roman civilisation and heathen practices. Despite the lack of literary profusion during the Middle Ages a strong oral tradition was maintained and stories from these mysterious times have inspired many writers. Eventually works from all over Europe did emerge and had a great influence on the evolution of literature with the writings of such luminaries as Chaucer and Dante still being studied in schools today. former Roman Empire were occupied by tribes who were not only pagans but also illiterate. Anglo-Saxon, or Old English, is the oldest form of our language. Modern readers, unless they have studied it, cannot read it any more than they can read classical Greek, but the language is not the only problem. It is much easier to relate to the ancient Greeks than to the Anglo-Saxons with their grim gods and bloody, beleaguered heroes. Life in an Anglo-Saxon village is more remote to us than life in classical Athens. We would feel more at home dining in some comfort in an Attic villa while a bard recites Homer than we would in the draughty hall of some Saxon chief, or even in the cloisters of a Benedictine abbey listening to the Latin chants of the monks. Beowulf, the first English epic, dates from the 7th century and runs to about 3,000 lines. It relates the adventures of a Scandinavian hero and his conflicts with several ghastly monsters, the last of which proves fatal. Though in verse, it depends more on alliteration rather than rhyme and, like all early poetry, was designed to be recited - intoned even. It is slow-moving, largely due to the rhetorical trick of describing every object by a metaphorical synonym. Homer of course always referred to the sea (for instance) as 'the wine-dark sea' (actually a mistranslation, but a happy one), but in Beowulf this device is carried to excess, each mention of the object being followed by a whole string of descriptive terms. Beowulf gets a mixed reception nowadays. It was defended in memorable terms by J. R. R. Tolkien, author of The Lord of the Rings: 'profound feeling, and poignant vision, filled with the beauty and mortality of the world, are aroused by brief phrases, light touches, short words resounding like harp-strings sharply plucked'. On the other hand, the late Brigid Brophy put it top of her list of 'works of literature we could do without'. The author of Beowulf is unknown, and although a number of Old English poems have been preserved, the names of only two poets have come down to us. In the case of Caedmon (late 7th century), a monk of humble origins, who is said to have translated parts of the Bible into English verse, it is little more than a name, since only one poem can definitely be ascribed to him. Cynewulf, who lived later, about the early 9th century, has had many poems on religious subjects ascribed to him, but modern scholars accept only four, to which his name was attached in runic characters, as definite. Beowulf - heroic poem, the highest achievement of Old English literature and the earliest European vernacular epic. Preserved in a single manuscript (Cotton Vitellius A XV) from c. 1000, it deals with events of the early 6th century and is believed to have been composed between 700 and 750. It did not appear in print until 1815. Although originally untitled, it was later named after the Scandinavian hero Beowulf, whose exploits and character provide its connecting theme. There is no evidence of a historical Beowulf, but some characters, sites, and events in the poem can be historically verified. The poem falls into two parts. It opens in Denmark, where King Hrothgar's splendid mead hall, Heorot, has been ravaged for 12 years by nightly visits from an evil monster, Grendel, who carries off Hrothgar's warriors and devours them. Unexpectedly, young Beowulf, a prince of the Geats of southern Sweden, arrives with a small band of retainers and offers to cleanse Heorot of its monster. The King is astonished at the little-known hero's daring but welcomes him, and after an evening of feasting, much courtesy, and some discourtesy, the King retires, leaving Beowulf in charge. During the night Grendel comes from the moors, tears open the heavy doors, and devours one of the sleeping Geats. He then grapples with Beowulf, whose powerful grip he cannot escape. He wrenches himself free, tearing off his arm, and leaves, mortally wounded. The next day is one of rejoicing in Heorot. But at night as the warriors sleep, Grendel's mother comes to avenge her son, killing one of Hrothgar's men. In the morning Beowulf seeks her out in her cave at the bottom of a mere and kills her. He cuts the head from Grendel's corpse and returns to Heorot. The Danes rejoice once more. Hrothgar makes a farewell speech about the character of the true hero, as Beowulf, enriched with honours and princely gifts, returns home to King Hygelac of the Geats. The second part passes rapidly over King Hygelac's subsequent death in a battle (of historical record), the death of his son, and Beowulf's succession to the kingship and his peaceful rule of 50 years. But now a fire-breathing dragon ravages his land and the doughty but aging Beowulf engages it. The fight is long and terrible and a painful contrast to the battles of his youth. Painful, too, is the desertion of his retainers except for his young kinsman Wiglaf. Beowulf kills the dragon but is mortally wounded. The poem ends with his funeral rites and a lament. Beowulf belongs metrically, stylistically, and thematically to the inherited Germanic heroic tradition. Many incidents, such as Beowulf's tearing off the monster's arm and his descent into the mere, are familiar motifs from folklore. The ethical values are manifestly the Germanic code of loyalty to chief and tribe and vengeance to enemies. Yet the poem isso infused with a Christian spirit that it lacks the grim fatality of many of the Eddic lays or the Icelandic sagas. Beowulf himself seems more altruistic than other Germanic heroes or the heroes of the Iliad. It is significant that his three battles are not against men, which would entail the retaliation of the blood feud, but against evil monsters, enemies of the whole community and of civilization itself. Many critics have seen the poem as a Christian allegory, with Beowulf the champion of goodness and light against the forces of evil and darkness. His sacrificial death is not seen as tragic but as the fitting end of a good (some would say “too good”) hero's life. That is not to say that Beowulf is an optimistic poem. The English critic J.R.R. Tolkien suggests that its total effect is more like a long, lyrical elegy than an epic. Even the earlier, happier section in Denmark is filled with ominous allusions that were well understood by contemporary audiences. Thus, after Grendel's death, King Hrothgar speaks sanguinely of the future, which the audience knows will end with the destruction of his line and the burning of Heorot. In the second part the movement is slow and funereal; scenes from Beowulf's youth are replayed in a minor key as a counterpoint to his last battle, and the mood becomes increasingly sombre as the wyro (fate) that comes to all mencloses in on him. John Gardner's Grendel (1971) is a retelling of the story from the point of view of the monster. Caedmon's poem was preserved in a manuscript by Bede, or Baeda "St. Bede the Venerable", (A.D. 673-735), the great figure of the early Anglo-Saxon period, who spent most of his life in a monastery at Jarrow and was known to later generations as the Venerable Bede. As a monk and a scholar, he wrote in Latin, and his most famous work, among many on various subjects, is his History of the English Church and People, which he completed in about A.D. 731. It describes the history of Britain from the invasion of Julius Caesar (55 B.C.) up to his own day and, although displaying understandable bias in favour of the Church and of his native Northumbrian kingdom - and against the marauding Vikings, destroyers of monasteries — it is generally both reliable and perceptive. Bede's History was translated into Old English as part of the literary revival associated with Alfred the Great, King of Wessex (A.D. 871-899). The King himself even translated some works from Latin for the furtherance of education, and he encouraged an important venture already in existence, the Anglo-Saxon Chronicle. The most important historical source for the period, the Chronicle was in fact several, produced in different versions in different towns: the Peterborough Chronicle is the most famous survivor. It eventually covered the period from the beginning of Christianity to the mid-12th century. 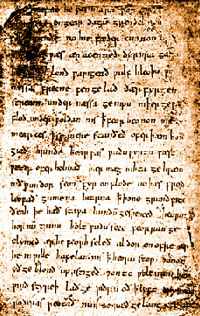 The records for the early years are merely a brief register, but from the 5th century the entries become more detailed, especially for certain events, such as Alfred's wars against the Danes, and poems are included, notably one about the Battle of Brunanburh (A.D. 937), best known in a translation by Tennyson. Middle English, the language of Chaucer, is easier than Old English for the modern reader. The transition took place gradually, but is conveniently dated from the Norman Conquest (1066). Thereafter the ruling class spoke French and, inevitably, English absorbed many French words. A more fundamental change was the loss of most of the inflections that, in Old English, indicated the function of a word within a sentence. Thus, in Old English it was possible to have a sentence in which, for example, the object preceded the verb, as in Urne dceghwamlican hlaf sele us todae, or 'Give us today our daily bread'. The suffix -ne (in urne) indicates the object of the verb sele ('give'). In Middle (or modern) English, it was necessary for the verb to precede the object. While the aristocracy spoke and wrote in French, the monkish chroniclers, such as William of Malmesbury and Geoffrey of Monmouth. wrote in Latin, the language of the Church. Geoffrey's History of the Kings of Britain (c.1148) helped to popularize the legends of king Arthur, and the first English version of Arthurian legend appeared near the end of the 12th century in a poetic history, the Brut, by Layamon. a Worcestershire cleric. It also contained the first English accounts of Lear and Cymheline. (late 12th century) and other French writers. Epic was characteristic of other European peoples. In France, the Chansons de geste , dating from the 12th century, recounted heroic episodes in the time of Charlemagne. They were similarly infused with a spirit of patriotism and Christian idealism, dealing in particular with the contest with Islam. The great Icelandic Sagas, mostly written down in the 13th century, also recorded the heroic pioneers of earlier times, such as Erik the Red who colonized Greenland in about A.D. 1000. They are prose narratives, however, in general less high-flown than French epic and more reliable historically. Wagner's operatic Ring cycle (1848-74), Gertrude Hall Brownell "The Wagnerian Romances", "The Nibelungenlied", Joseph Bédier "The Romance of Tristan and Iseult". The Flying Dutchman PART III. Most medieval writing was religious, and miracle plays, as they were called, were dramatizations of miraculous episodes from the lives of the Christian saints. Later they included stories from the Bible (first translated in full into English in the 14th century) and were called mystery plays ('mystery' referred to a craft or trade). They were commonly performed in the market-place by local craftsmen, often with much humour, sometimes macabre, and (as in modern pantomime) with contemporary allusions. Each craftsmen's guild had responsibility for a particular piece, frequently linked with the craft concerned. In York, for example, the Shipwrights performed the story of Noah's Ark. 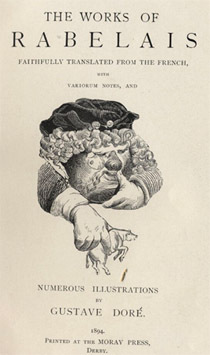 A later development was the 'morality play', in which the characters are personified virtues and vices (Beauty, Truth, Greed, etc.). Complete cycles of mystery plays have survived from Chester, Wakefield and York, but many other towns had them. Some show considerable literary merit. They were popular in most of Europe, but in England they were finished off by a combination of the Reformation (opposed to religious pageantry), realist drama and professional theatre. They have been revived in the 20th century and The Passion Play of Oberammergau, Bavaria, dating from 1633, is still produced. The two poetic gems of medieval England, Geoffrey Chaucer apart, are The Vision of Piers Plowman and "Sir Gawain and the Green Knight". Although William Langland, author of Piers Plowman, and the unknown author of "Sir Gawain" were contemporaries of Chaucer, they seem to have belonged to an earlier age, partly because they used the old technique of alliteration rather than the syllabic rhyming verse introduced from France. 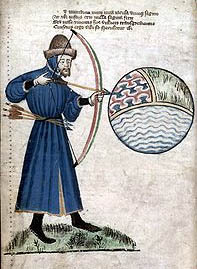 Piers Plowman, often described as the greatest religious poem in English, opens with the narrator falling asleep on the Malvern Hills and dreaming that he sees 'a fair field full of folk', where he can observe the whole of society engaged in their tasks. The poem contains episodes of great imaginative power, unequalled by any other medieval writer. The subject of "Sir Gawain" is an episode in Arthurian legend, in which "Sir Gawain" overcomes a supernatural opponent, the fearful Green Knight. Though an impeccable epic hero. Sir Gawain remains human and fallible, and the poem, about 2,500 lines long, is written in gorgeous and complex language. It survives in only a single manuscript, which also contains three other alliterative poems of high quality, 'The Pearl', 'Patience' and 'Purity1 which, though of a completely different type, are probably by the same poet. "After sharpe shoures,' quod Pees • 'moste shene [bright] is the sonne; Is no vveder warmer • than after watery cloudes. Ne [nor] no love levere [dearer] • ne lever frendes. Than after werre [war] and wo • whan Love and Pees be maistres. Was nevere werre in this world • ne wykkednesse so kene, That ne Love, and [if ] hym luste • to laughynge ne broughte, And Pees thorw pacience • alie perilles stopped.' 'Truce,' quod Treuth • thow tellcs us soth, bi lesus! Clippe [embrace] we in covenaunt • and each of us cusse other!' 'And lete no peple,' quod Pees • perceyve that we chydde! For inpossible is no thying • to him that is almyghty." Piers Plowman, (B-text) 17, (ed, Alastair Fowler). offices at court, and he undertook diplomatic missions abroad. The learned John Gower (d. 1408) was a contemporary and friend of Chaucer who wrote in three languages, French, Latin and English. He was responsible for bringing much classical literature (especially Ovid) and medieval romance into the mainstream of English literature. His greatest work is Confessio Amantis, which contains a series of stories in verse, rather like The Canterbury Tales. In fact several of Gower's stones are echoed in Chaucer's great work. In The Canterbury Tales, the framework for the stories is a group of pilgrims who meet at an inn in Southwark on their wav to the tomb of Thomas Becket in Canterbury and, for the prize of a free supper, agree to tell stories to pass the time. Some of the stories are fables, some are moral, some romantic, and some comical and coarse (schoolteachers used to avoid 'The Miller's Tale'). Several are based on Petrarch and Boccaccio. There are about 30 pilgrims but only 24 stories: the work was unfinished, but it runs to about 17,000 lines, most, in rhymed couplets, some in prose. Although he could write lovely lines, Chaucer was not a great lyric poet. He was a great story-teller, a master of comedy, the first illustrious name in the great tradition of English comedy — and he had an understanding of human nature that rivaled Shakespeare. The form of The Canterbury Tales is a familiar one. What is new is the intense realism of the characters. 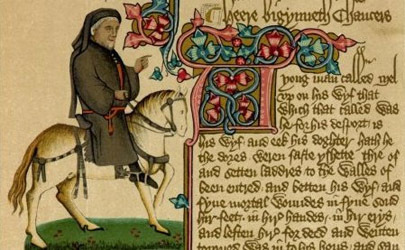 Chaucer not only had a profound and sympathetic understanding of human nature, he also seems to have had comprehensive knowledge of all levels of English society. His characters are the first in English literature who leap off the page, alive and kicking and totally believable, their virtues and still more their vices are all too easily-linked with contemporary equivalents. For Frenssh of Parys was to hire unknowe,"
Chaucer, The Canterbury Tales, 'Prologue', 1,122. Chaucer was widely admired in his own time. Thomas Hoccleve, a younger contemporary who is sometimes unjustly dismissed as a mere imitator of Chaucer (and there were many of those), called him his 'master dear, flower of eloquence'. The manuscript of Hoccleve's De Regimine Principum (The Regiment of Princes) has a portrait of Chaucer in the margin. The poet appears as an elderly, white-haired man: this is clearly intended to be a likeness, another example of the dawn of realism. The flowering of English literature about the time of Richard II (1377-99) was followed by a comparatively barren period. In Scotland, however, the flowering came later, during the reigns of the cultured Stewart monarchs James III and James IV. The outstanding poets were Robert Henryson (d.?1506), William Dunbar (d.?1513) and Gavin Douglas (d.1522), who translated the Aeneid and was one of the first to emphasize the distinction between 'Scottis' and 'Inglis'. Henryson's Testament of Cresseid follows on from Chaucer's poem about the same lady. Chaucer is not always an easy read, even with modernized spelling, but the dialect of Henryson's poem, although written roughly a century later, is harder, which, together with his powerful, though humane, morality, may explain why it is not better known. Dunbar, a sharp satirist with a ribald sense of humour, is for most moderns a more attractive figure, although he is best known for a decidedly doleful work, his elegy on the transitory nature of life, 'Lament for the Makaris', with its haunting Latin refrain, Timor mortis conturbat me ('The fear of death convulses me'). Circumstantial evidence suggests that death came to Dunbar on the terrible battlefield of Flodden. An equally well-known and evocative verse refrain is Mais ou sont les neiges d'antan? (But where are the snows of yesteryear?). It comes from a poem Ballade des dames du temps jadis ('Ballad of the women of olden times') by Francois Villon, who lived in the mid-15th century and seems to have spent most of his life dodging the gallows. He was little known outside his own country until the 19th century, but is now widely regarded as the greatest poet of medieval France. History gets more eventful, and change happens faster and more dramatically, the nearer you approach the present - or so it seems to us, at the leading edge. In the Middle Ages, change was so slow that people were hardly aware of it, there was a sharp quickening in the Renaissance and a tremendous spurt with the Industrial Revolution, since when the pace has become ever more frantic. Whatever the truth, this does not hold for literature. It could be argued that, for European literature, the two centuries preceding the Industrial Revolution were more eventful than the two centuries following, though the reasons were not all literary. In the Renaissance, there was a hugely important development - the invention of printing with movable type, which made books as we know them possible. The establishment of nation states, especially in England and France, coincided with the establishment of the vernacular, a national language, which proved especially productive in England and France before the bones, so to speak, had set hard. By the 18th century, every form of literature was established in, or near to, its modern form, including the all-important genre of the novel, the one form of literature of which practically everyone today has some experience. In the early 16th century, French was becoming established as a literary language. Poetry, especially lyric poetry, flourished; no more productive period for French poetry (excluding drama) would occur until the 19th century. However, the two greatest French writers of the century, especially in terms of their influence on literature in general, both wrote prose, though of totally different kinds. 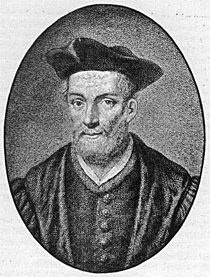 Rabelais (d.1533) is now not often read, partly because of the difficulty of translating this exuberant genius. He was at one time a monk, then a wandering scholar, then a physician, who wrote learned works on medicine in Latin. But he is remembered for his humorous, ribald, life-affirming tales of the popular giants Gargantua and Pantagruel, a vast, bubbling collection of stories and learning, condemned by some as obscene. Like Machiavelli, he bequeathed us the adjectives 'rabelaisian', and 'gargantuan'. The difference between Rabelais and Montaigne "The Essays" (1533-92) has been likened to the difference between a pub at closing time and a quiet public library in mid-afternoon. 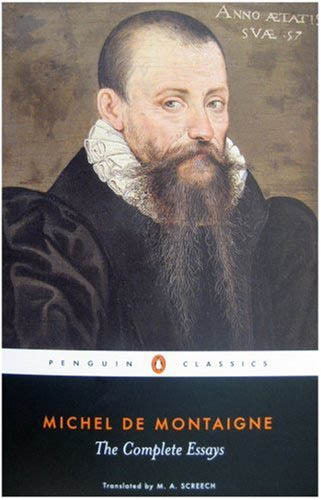 A scholarly country gentleman, Montaigne is regarded as the inventor of the essay. His first volume of essays was published in 1580 and reissued several times with extensive additions. They reflect the author's changing philosophy and were increasingly based on his searching analysis of himself. 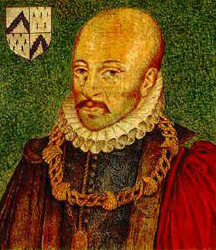 Amused, tolerant, sceptical, Montaigne was the first great master of French prose, a model to later generations and a pervasive influence on other writers, including Shakespeare: one of his essays was a source for The Tempest. 'There is scarcely any less bother in the running of a family than, in that of an entire state. Little memorable poetry was written in England in the century after Chaucer's death, perhaps because everyone was trying to imitate Chaucer. As in so many other respects, English poetry of the early 16th century took its example from Italy. Sir Thomas Wyatt, who visited Italy in 1527, wrote the first English sonnets as well as translating Petrarch, from whom he learned the art. Henry Howard, Earl of Surrey, also wrote sonnets after Petrarch, but he adopted a different rhyming system, which became standard for Shakespeare and other English sonneteers. He was also the first to use blank verse - in his translation of the Aeneid. He was executed on an improbable charge of treason in 1547. 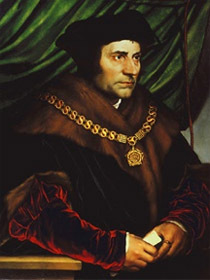 The same lamentable fate befell the admirable Sir Thomas More in 1535 when, as Lord Chancellor, he could not bring himself to accept Henry VIII's reformation of the English Church. Literature was More's great recreation, and he wrote (in Latin) "Utopia", an early attempt to describe an ideal civilization, while he was on diplomatic business abroad. 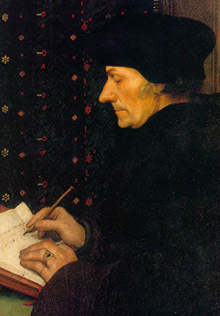 Prominent literary figures were often to be found at his house, and some were painted there by Holbein, who was introduced by another visitor, the Dutch-born Desiderius Erasmus (d.1536), the greatest humanist scholar of the age whose output was prodigious. It was More who suggested the ideas behind Erasmus's most famous work, The Praise of Folly, a satire aimed chiefly at the leaders of the Church. 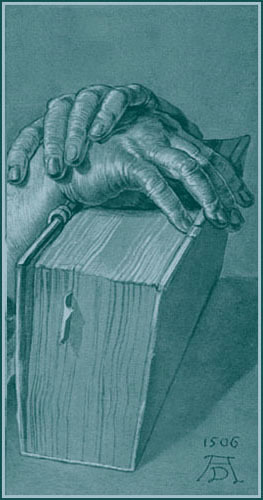 His scholarly work on Classical and early Christian writers, and his translations of the Bible, had an immeasurable effect on contemporary European culture and encouraged the Reformation, though Erasmus himself remained loyal to, though critical of, the Roman Catholic Church.